I’ve worked 4 years alongside nutritionists. I dug down the rabbit hole of nutrition and tried a lot of different diets and biohacking techniques. In the end, it seems that real food and simplicity are the best options. Now there is the theory and the practice. Depending on the environment, it can be challenging to eat healthy. However, there is one meal for which there is no excuse: breakfast. 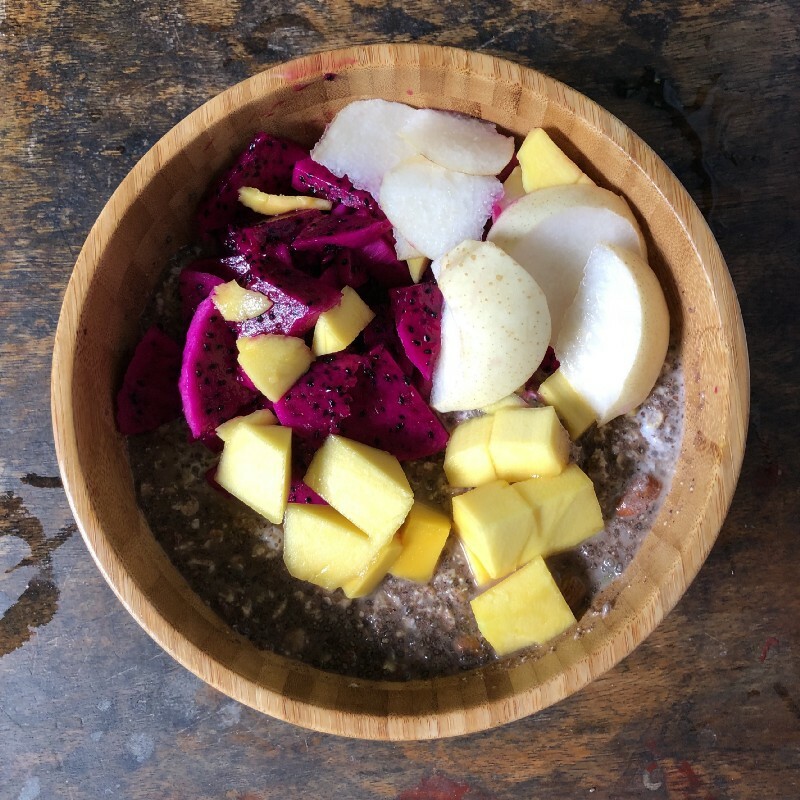 Because it’s not a social meal and I don’t mind repeating the same every day, it is worth getting something super healthy, affordable and convenient. So I always recommend tackling breakfast first. Because I eat the same every day and diversity is important, I want to make sure I have a recipe with diversity. As with anything when it comes to nutrition, it gets controversial. According to my research, the best diet is as much plant-based as possible. It is influenced by Dr. Michael Greger, the best and most ethical nutritionist out there according to me. 240g of oats. This is the basis of the recipe. As they are complex carbs, they take more time to absorb, which is better when you start the day. 60g of a mix of almonds, brazil nuts, pumpkin seeds & walnuts. Healthy fat and full of micronutrients. 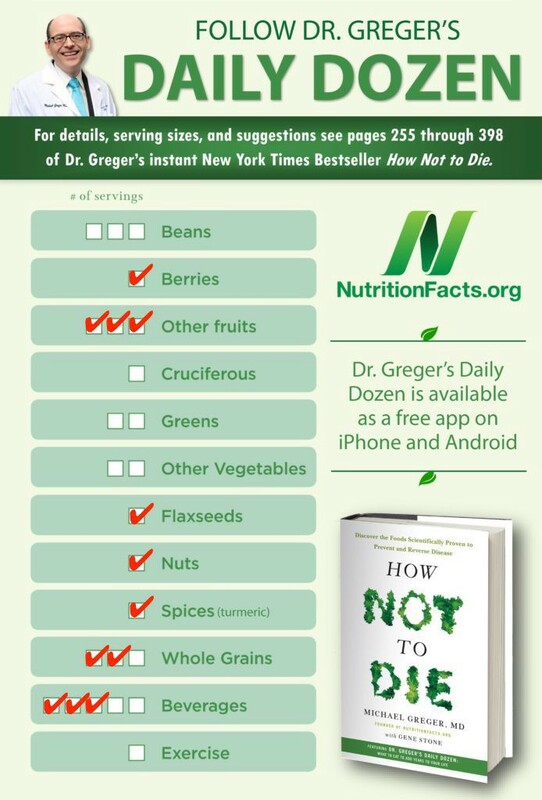 60g chia seeds & hemp seeds, which belong to “nuts” in Greger’s daily dozen. These 2 are high in protein so I make sure I have half of my nuts from high-protein sources. 60g flaxseeds. These are cheap and amazing. Super high in Omega-3, in antioxidants and in fiber. Make sure to grin them otherwise you won’t access the omega-3s. 20g cinnamon. It tastes slightly sweet but it’s healthy spices. 60g cocoa nibs. Cocoa has a number of brain and health benefits. 60g of berries. I use frozen ones because they are cheaper and more convenient. 3 pieces of medium-sized fresh fruits. It really depends on the seasonality and location. 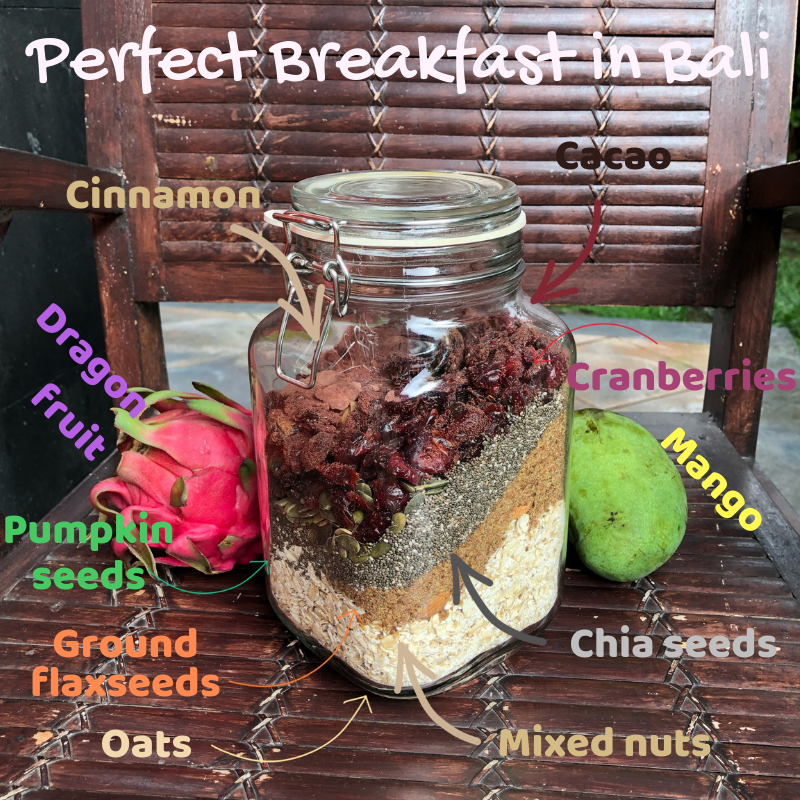 With this recipe, I not only tick a lot of Greger’s boxes, but I also make sure I get some “superfoods”, foods very rich in antioxidants and great for the brain. It is also a good balance of healthy fats, protein and complex carbs. To get a bit more protein, I add a 100mL of soy milk in the morning. Then for lunch & dinner, I diversify and go with lots of veggies and beans and a few whole grains. For example, plenty of veggies with lentils & quinoa. With only one of the 2 meals, I’ve checked all of his boxes. Again it takes 5 min to prepare for the next 4 days, which is important because we want to be realistic. After a few years as a growth hacker for startups and starting a few side businesses myself, I've decided to follow my passion: personal growth. I believe we live at a very exciting time. Today, you can learn from the best in the world and keep learning at a very fast paced. This is what motivated me to create the UNLOCKT programs that combine the best content from the best in the world with simple and sustainable daily actions. UNLOCKT builds programs but also does events, a community and a podcast. What passionates me is building and joining communities of loving, conscious and performant people. What I call Dreamers & doers. So don't hesitate to reach out if it resonates.